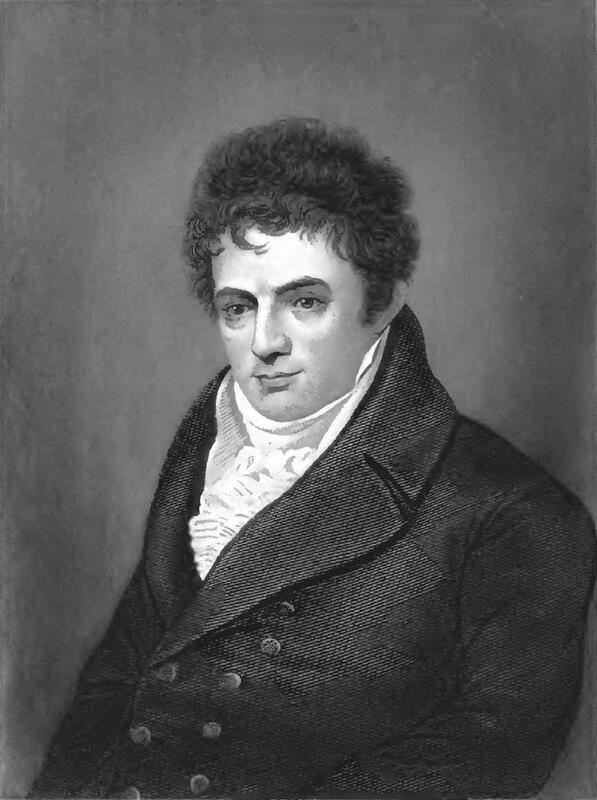 Robert Fulton was an American engineer and inventor who is widely credited with developing the world’s first commercially successful steamboat in 1807 that plied a route between New York City and Albany. However, it is his earlier adventures with prototype submarine warfare that I am making the subject of this post. In the mid 1790s he went to Paris where his reputation as an inventor was already known and petitioned the French government to support his design for “a machine which flatters me with much hope of being able to annihilate their [England’s] Navy.” That machine was a submarine. In Fulton’s design the submarine would tow an underwater bomb (which he called a torpedo) to be planted under enemy vessels. 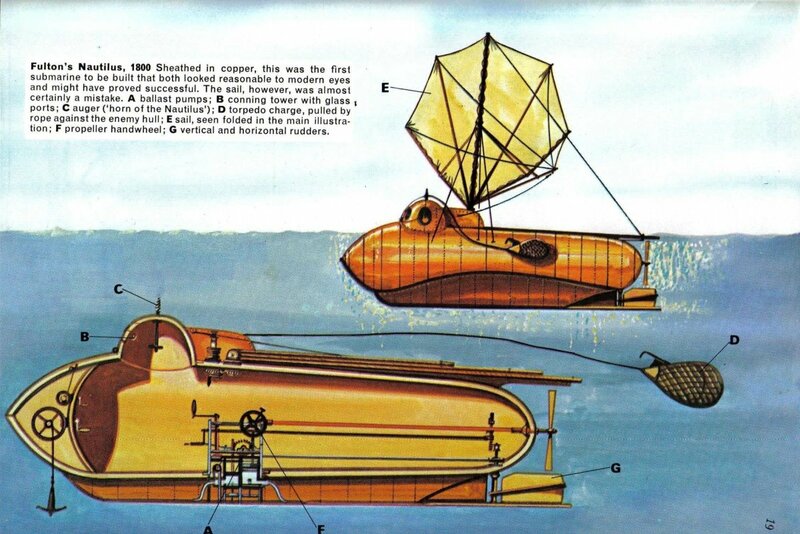 The initial response was positive and after some negotiations, the American inventor delivered a detailed plan for a vessel he baptized the “Nautilus”. However, before construction began, the Minister of Marine cancelled the project. A year later, after a change of minister, Fulton pressed again and a specially appointed commission examined his designs and recommended proceeding with the construction of the submarine. However, the government still prevaricated. After the coup of 18 Brumaire, which elevated Napoleon to power, Fulton decided to insist one more time. In 1800, he sent a letter to the Minister of Marine with a proposal to build the Nautilus. The American inventor was convinced that his submarine would bring to an end the supremacy of the Royal Navy. Napoleon learned about the project and appointed a commission to study its feasibility. Fulton subsequently built and launched the Nautilus and conducted several successful trials first in Paris and then at Le Havre. “Navigation under water is an operation whose possibility is proved,” he confidently wrote to the members of the commission in November 1800. In February 1801, the Minister of Marine wrote to Fulton saying that Napoleon had approved his proposals and that he would be paid 10,000 francs to improve and test the Nautilus at Brest. Fulton moved there for a few months and conducted several successful experiments. “I conceived every experiment of importance to be proved in the most satisfactory manner,” he wrote to the commissioners in September 1801. He also wrote again to Napoleon but received no response and with the signing of the Treaty of Luneville and the subsequent Peace of Amiens, Napoleon’s interest in Fulton’s proposals waned completely. Unfortunately for Fulton, Nelson had just destroyed French and Spanish naval power at the battle of Trafalgar rendering torpedoes unnecessary in the eyes of the Admiraly. And to make matters worse for Fulton, Pitt, who had been one of his most important supporters, died in early 1806. During the rest of that year, the American inventor became embroiled in a bitter negotiation with the British government to get paid what he believed were his fees. With no success, at the end of 1806 Fulton left for New York. There, though Fulton continued to experiment with torpedoes and submarines, his focus shifted to the development of a steamboat. 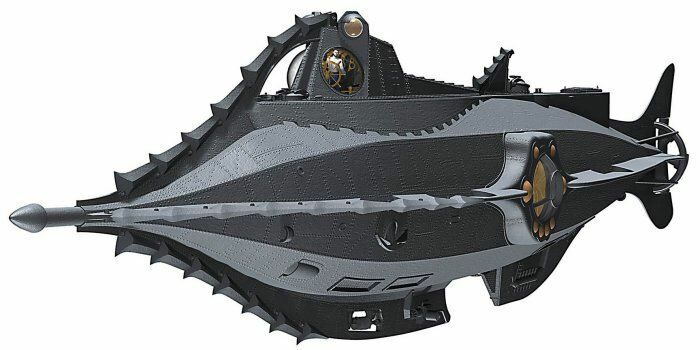 Submarines would have to wait and they were still notions of fancy when Jules Verne commandeered the name of Fulton’s submarine for his own creation in 1870; Captain Nemo’s vessel in Twenty Thousand Leagues Under the Sea.